Guest author Heather Schubert writes The Unknown Soror. This essay will also appear in an upcoming issue of Daughters of Babalon, Volume II: The Women of Babalon, an anthology of works by a broad range of modern writers and artists that captures the rich and multifaceted aspects of the feminine current of Thelema. Consider checking out that anthology, but you can read this essay here at Hermetic Library first. I’m happy that Hermetic Library can help support and encourage new work like this essay on Anne Maria Macky née Hawkins, also known as Soror Fiat Yod, or The Unknown Soror. The “Unknown Soror” refers to the woman whose tenacity and thirst for spiritual and occult knowledge eventually led to the book we now know as, Aleister Crowley’s Magick Without Tears. The idea for this publication was born when he met a bright and inquisitive young woman in 1943 and he intended to call it Aleister Explains Everything. She was clearly on the path to her own spiritual enlightenment. They began corresponding immediately and as she walked her path, she questioned him about a wide array of occult and spiritual subjects. Barely any information is given about this mysterious Aspirant beyond the fact that she was female. There is a tiny reference to her in the foreword that appeared in the first edition of the book, but even though Karl Germer goes on to confirm possession of the letters she wrote to Aleister Crowley, there is still no mention of her name. Curiosity inspired me to discover more about this fascinating woman, the “Unknown” Soror. The completed Magick Without Tears consists of 80 letters to several different students and covers wide variety of magical topics. Initial research yielded confirmation that 50 of the 80 letters came from the “Unknown Soror”. As I continued my research the name Anne Macky appeared. The most information written about her to date is available on the Zero Equals Two website and tells of her correspondences with Aleister Crowley but nothing personal and no details on her life or who she was. I found a couple more references to Anne Macky in correlation with Magick Without Tears. One is in the biography Perdurabo by Richard Kaczynski, where she is listed simply as “an English Woman”. While researching a stack of letters for auction I discovered mention of a receipt by Weiser Antiquarian that listed her as “Anne Macky of Hertfordshire, England”. Anne Macky was Australian. She was born Anne Maria Hawkins, on February 8, 1887 in Fitzroy Australia. Next to nothing is known of her childhood. We do know that she was very fond of her maternal second cousin Walter James Turner. He was a poet, writer and musician who believed that art had the potential to elevate the soul and to perceive something of one’s true spirituality. These beliefs made a strong impression on young Anne during her formative years. She clearly believed art and music to be a “revelation to transcend the limitations of material reality”, as he so often claimed. The influence of these ideas can be seen throughout Anne’s lifetime, especially within her musical compositions. In the following quote we can begin to see how her perception of art and beauty was ahead of her time and also spiritual in nature. In 1901 Anne Hawkins matriculated at the age of 14, which was largely unheard of for women during her time. She received the Senior Certificate of the Royal Academy of Music, London. After studying pianoforte with Eduard Scharf and harmony with W. Coutts at the Albert Street Conservatorium. She became a music teacher. Records show that from 1903 to 1904 she taught lessons at Miss Cathcart’s High School at Williamstown; Camperdown College in Ballarat from 1904–1905; Miss Gregory’s School in Manning Road, East Malvern in 1906; and Brighton High School from 1906–1908. Anne was registered as a preschool, primary and secondary teacher who was proficient in each of the subjects she taught including, but not limited to, Latin, Math, English, French, History, Algebra, Psychology, Botany and Music. In 1916 she married Dr. Stewart Macky, a New Zealander. They both had a mutual understanding of the significance the arts have on social renewal and a shared interest in anthroposophy. In 1917, with the financial help of a family inheritance, she opened The People’s Conservatorium. She wanted to bring a higher standard of learning to everyone with a talent for the arts. She believed that just as studying other subjects made one more proficient at them, so too could this model be used for the arts. Enrollment fees were kept low and the Conservatorium offered several scholarships for those who could not afford to attend. These policies stayed in place throughout the 1920’s and the beginning of the Great Depression. It was truly a conservatorium for the people. While she made it easy for anyone with a talent for music to attend, her standards for running the school were high and the teachers at her conservatorium were of the highest caliber. Women during this era didn’t usually do things of this magnitude. She was quite the pioneer in her time and her achievements were often reported in the local newspapers. Anne Macky traveled to London in 1922 to attend a Conference at Oxford College where she heard Rudolf Steiner speak. His teachings in anthroposophy were in line with the values and ideas Macky held from an early age. Rudolf Steiner’s talk made such an impression on her that she went on to establish regular Anthroposophy meetings in Melbourne from 1928 to 1932. Around this same time she co-founded the Michael Group, a branch of the Anthroposophical Society in Melbourne Australia. Once in London the Mackys quickly became involved with several artistic and eclectic groups. She, of course, joined the Society of Women Musicians. Her cousin, W.J. Turner, introduced the Mackys to many artists, composers, and writers that included James Stephens, the pianist Schnabel, a Russian immigrant well known in literary circles named Koteliansky, G.P. Wells, the son of H. G. Wells, painter Mark Gertler, and writer Edward Bryant. Having heard of his expertise in occult knowledge Anne Macky wanted to meet Aleister Crowley. She arranged for Edward Bryant to make the introduction. On March 12, 1943 he took Anne Macky out to lunch at Hatchett’s restaurant and introduced her to Aleister Crowley. Aleister Crowley noted this meeting in his journals and remarked that Anne Macky was “not so bad”. Anne Macky was intrigued by Aleister Crowley, and she visited him on her own the very next day. Crowley writes that they had a long talk, after which he nearly threw her out. Evidence suggests that they remained in contact and on April 16th Crowley received an eight-page letter from Anne Macky. He, in turn, wrote her an eight-page response and thus began their correspondences that would eventually evolve into the work we know as Magick Without Tears. Perhaps it was her tendency for shaking him up that encouraged him to remain in contact with her after stating that he almost threw her out after her first visit. Crowley valued intelligent, determined individuals who weren’t afraid to be blunt. Anne Macky more than met that criteria and he obviously liked her. He had a way of poking fun at people that was sometimes even rude. At one point in his journal he calls her a “Poor old wallaby”, a rather delicate jab that also speaks to her country of origin, Australia. According to the journals of Anne Macky she moved around a lot, as most families in England did during World War II. They were attempting to seek refuge from the bombing raids. Her journals tell us that she was in Kings Langley in 1943. Her piano pieces appeared on the program from performances at Orchard Finishing School in Kings Langley on January 16, 1943. One of the letters Aleister Crowley exchanged with Anne Macky has her Kings Langley address on the envelope and it is postmarked 1943. Kings Langley is just down the road from Leverstock Green. Pancake School was the local school in Leverstock Green. Anyone involved in the school might receive their mail at Pancake House, at Leverstock Green. 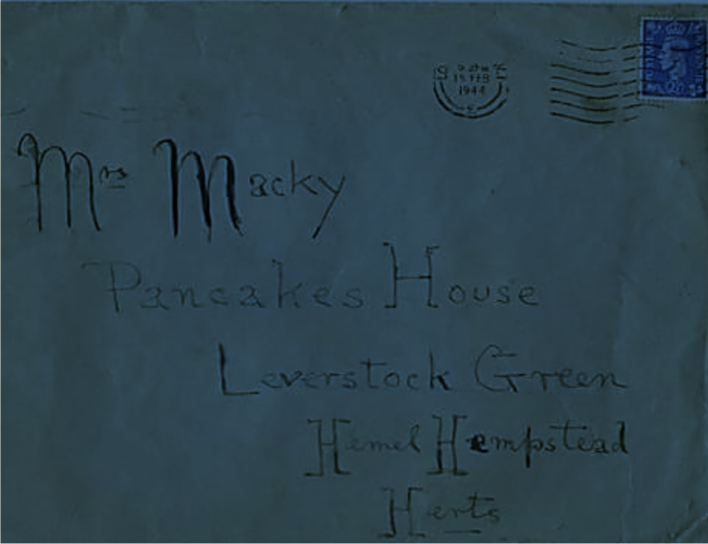 Another one of Crowley’s correspondences with Anne Macky has the Pancake House at Leverstock Green address. I spoke with a British Historian who has archived many years of history revolving around the Leverstock Green estate and she confirmed what the envelopes show, that Mrs. Anne Macky, Australian teacher, musician, composer, and entrepreneur lived at Leverstock Green in 1944. In late June of 1943, Anne Macky’s correspondence with Aleister Crowley shows they discussed magick and a certain Rite. From the information in his journals we can say she was undoubtedly a member of the A∴A∴ and was interested in joining the O.T.O. He sent her O.T.O. contact information for people who would initiate her into the order. She inquired further requesting more personal information about these members and he responded by telling her that the Path is an individual one, that the O.T.O. was not a social organization. He goes on to explain to her that the etiquette of secret orders is such that members should not reveal the names of other members, unless they are dead. Yet, he went on to confirm Steiner’s involvement in the same paragraph, though he still lived at that time. On August 17th she informed him in a letter that her motto was in fact Fiat and the letter four, which is Yod, producing Soror “Fiat Yod”, (811+20=831). It’s interesting that the motto he came up with for her and the one she discovered on her own have the exact same numeration. Crowley accepted Fiat Yod as her motto and she is often referenced by a simple “FY” in his journals from that point on. 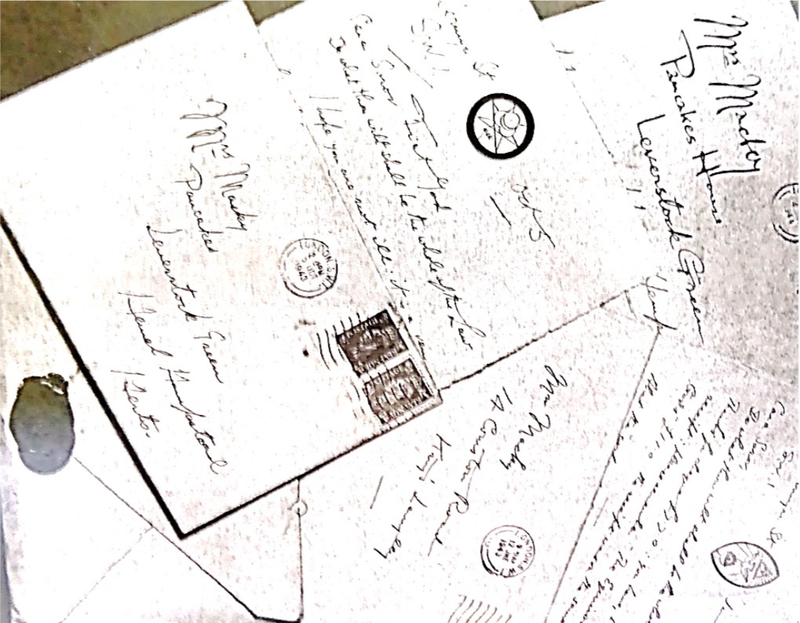 Aleister Crowley corresponded with many aspirants via hand written letters, as was common in his day. Magick Without Tears was created from the content of his correspondences. It is commonly understood that they were all written to Jane Wolfe – and maybe a few of them were (perhaps, most notably, the letter on Authority). Even though little to no credit is given to Anne Macky, most of Magick Without Tears was born from Crowley’s correspondences with her. In his journals Crowley states that he struck a bargain with Anne Macky. He paid her the sum of 20 pounds on October 26, 1943. She was to write 50 letters with questions for him to answer and they would eventually be put into a book, Magick Without Tears. She accepted, and by November 10th of that same year he was working on responding to her eighth letter. At times they argued over the content of the letters and money. Eventually she also requested a copy of the completed book as payment. By November 16th he began referring to Anne as “Mrs Mother Murrmbidgee”. Yet she visited him in person again just two days later and she brought with her a “lovely spray of orchids, white, yellow and purple” and he made comments about the “8 and 90 rules of art”. In a journal entry from January 3rd, he writes about creating a “Rabelaisian List of Adjectives for Steiner and Co.” intended for Anne Macky. On Jan 6, 1944, Aleister Crowley remarks that he received 26.5 pounds from Anne Macy as well as Chpt XIII to XXV. She missed a meeting with him on January 12th and did not call to say why. He remarks in his journal that he couldn’t reach her over the phone on Jan 13th and he eventually wrote to her at Pancake School in Leverstock Green on January 16th. Evidence shows that by January 28, 1944 their correspondences were back on track. Crowley notes receiving a charming letter from her at that time. They were supposed to meet on February second, but Anne called it off due to her husband being ill and collapsing. On February 16th she wrote what Crowley referred to as “Anti-Crowley–grouse” before informing him on March 10th that she was breaking the contract they had between them. On April 3rd the two had a long talk about magick and other things and by April 16th she had resumed writing the letters. It’s clear that she was often cross with him, but their friendship and correspondences for his book continued. She phoned him on July 11, 1944 and went to lunch with him the next day, which he regarded as a “very bright and pleasant” experience. The last documented correspondence from Anne to Crowley came later that year in August. Anne Macky returned to Australia in 1946 where she continued teaching and composed numerous works that were regularly performed in Melbourne and occasionally broadcast over the radio. She died in 1964 at the age of 77. 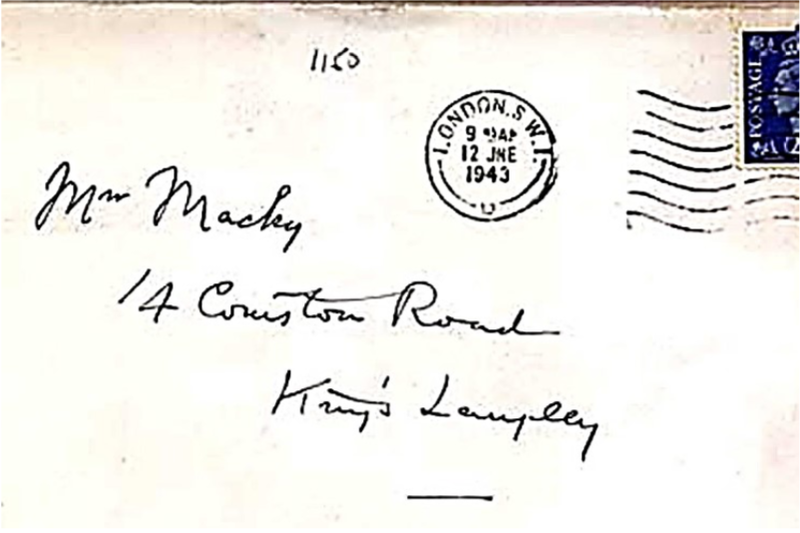 I have confirmed, via her personal journals, that Anne Maria Macky (maiden name Hawkins) lived at the Kings Langley address at the same date in which the envelope from Aleister Crowley addressed to “Anne Macky” was postmarked and sent to the exact same address. There is further proof that suggests she lived at the Pancake House address at the exact date in which the envelope, addressed to Anne Macky from Aleister Crowley was postmarked for that address as well. British Historian Barbara Chapman confirmed her residence at the Leverstock Green address and sent me some information on the letters that were auctioned off to the O.T.O. Karl Germer mentions he met the Unknown Soror in 1943, the same year Aleister Crowley began corresponding with her. Letters E & F from Magick Without Tears and journal entries identify Anne Macky as Soror Fiat Yod. Letter H has this footnote “A letter dated Oct 12, 1943 constitutes letter 48”. In his journal he records receiving a letter from Anne Macky on this same date. This footnote points to the inclusion of Macky’s letters throughout Magick Without Tears as we know from Crowley’s journals that on August 23, 1943 Anne Macky accepted a contract to write 50 letters. Her name is not given in the published work, nor is the proper order of the letters given, nor which letters went to whom. However, upon reviewing both Aleister Crowley’s journals and the journals of Anne Maria Macky it becomes clear that the majority of the material for Magick Without Tears came from the many correspondences between the two of them. My search continues for more information on this talented woman, who played a significant part in the history of Thelema and led quite a fascinating life. One thing is certain, it is safe to say that the “Unknown Soror” mentioned by Karl Germer in his introduction to Magick Without Tears, undoubtedly now has a name, and she is Anne Macky, Soror Fiat Yod. Heather Schubert is a practicing Thelemite, ordained Priestess in Ecclesia Gnostica Catholica, writer, poet, visual artist, teacher, and mother of four children. Heather is the editor of Daughters of Babalon, an anthology of works by a broad range of modern writers and artists that captures the rich and multifaceted aspects of the feminine current of Thelema. She runs The Light Is One Clerk House of the A∴A∴. Her multimedia artwork at Little Beastlings specializes in Thelemic toys and learning materials for children as well as creepy Gothic creations. 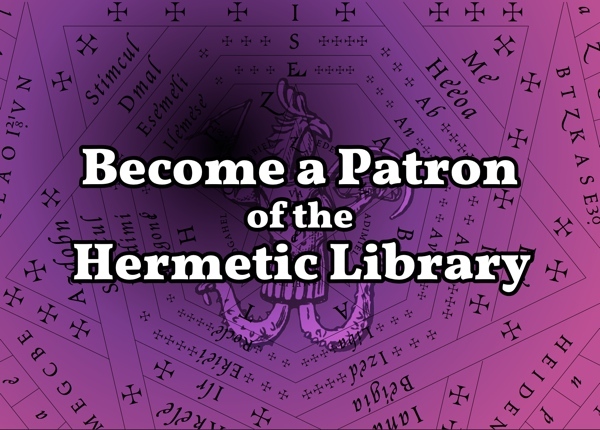 This guest post was brought to you by the generous supporters of the library, including each ongoing Patron of Hermetic Library on Patreon. 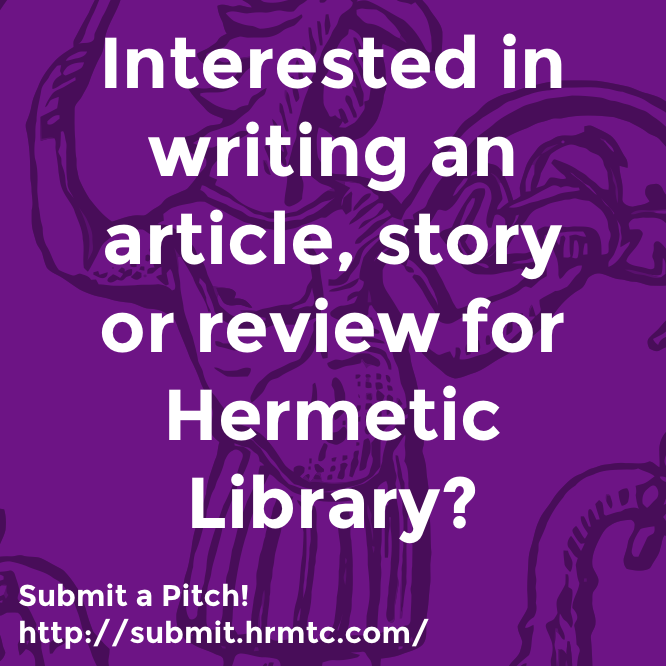 Want to create new work for Hermetic Library? Pitch your Idea! 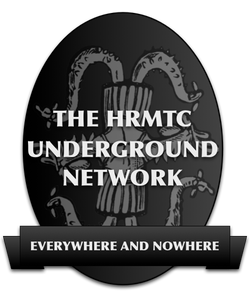 This entry was posted in The Hermetic Library and tagged aleister crowley, Anne Maria Hawkins, Anne Maria Macky, article, guest, Heather Schubert, submission, thelema on October 22, 2018 by John Griogair Bell.